what must be the best Mithun movie EVER. Is it too much to ask that this is a scene from an actual movie and therefore there might be three more hours of similar fun? Pleeeeease? In other news, a shopping spree has yielded 15 new Shashi Kapoor movies, ranging from Dharmputra (1961) to Suhana Safar (1970) to Ganga aur Suraj (1980). Don't say you weren't warned. What a treasure trove of pics! 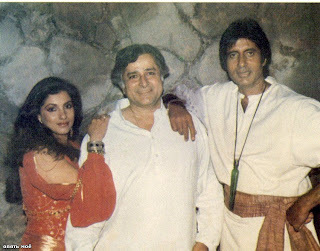 That first one looks like it was taken during the filming of Ajooba, Shashi's first and only directorial venture. I dont think that Mithun pic is from an actual movie - though he is certainly posing like Bond 007! My god those pictures are a treasure trove! Great pictures... love the Neetu/Amitabh one. Mithun as James Bond...what a lost opportunity! The Neetu/Amitabh promo is great too. Anyone know what that was from? Because clearly, those are dance moves I need to learn. OMG that first pic is probably from the sets of Ajooba, which SK produced. How could he have been so happy if he actually went on the set and saw what that crap was shaping up to be? Anarchivist, i bet that pic is from Yaarana which features this fabulous song - AB in an electric light suit! Those Russians know their stuff! Oh, Ajooba! 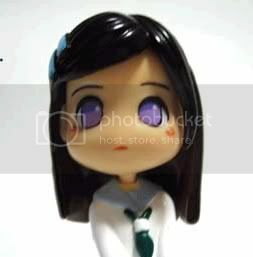 How I long to own you! I absolutely must see it even though everyone says it's awful. DG - Me too. I love their funky moves. Anarchavist and Amrita - If you look at the picture just above that one on the Russian site, it's the cover of the album for Adalat. I too want to bust those moves - they are awesome, and I think I could actually do them. They might even be a little bit Tae-Bo, based on this picture..... Neetu and Amitabh are one of my favorite couples, even though I think I've only seen them as such in Parvarish. That Mithun picture is hilarious! I so wish it was from an actual movie, because it ROCKS. I LOVE the Shashi pic- he is just so...huggable! Shweta - I went through Mithun's imdb list last night looking for a movie title whose words started with N and L, but no luck (haha). OH! I just realized I know a mega Mithun fan. I'll ask him! Beth, I am shocked - shocked! - to hear your readers maligning a fine film such as Ajooba. What kind of an establishment are you running here? After all, this is the only Amitabh film in which he can be seen battling a giant, Godzilla-style, man-in-a-rubber-suit monster. As such, it is not only a great film by default, but also a necessary contribution to world culture. Quality control around here is lax. Peronally, I am a staunch defender of Ajoob, even though (because?) it keeps eluding me. It will be mine. Oh yes, it will be mine. That Mithun movie looks like Humse Na Takrana (1990) (it has everyone mentioned by Shweta but no Dimple) and the one in silver dress on his right is Kimi Katkar. And on the left most the Padmini Kolhapure look alike also looks like Ranjita. Wow! Beth, fifteeeeeeeen SK movies. *drool drool* Looking forward to read about them. Btw, Ajooba is one of my favorite Amitabh movies, the sword scene near the end being the most favorite one. Thanks for the lovely photo of Shashi, Beth. His smile is to die for and those non-aligned teeth he has got just add charm like icing on the cake... I want to sing "maar daala allaah maar daala"
kanan - Never fear, there will be bahut Shashi coming up, probably for a few months solid. I hope I don't have any non-Shashi-liking readers, because they're going to drop me like a hot potato. Todd and others will be delighted to know that you like Ajooba; I'm in the middle of trying to track down a copy. Isn't he adorable there? If that is from Ajooba and I have my history right, his wife probably just died, so it's nice to think of him smiling and being with friends. And thank you re: banners! I love to make those (no surprise), and if you ever find a picture you think I need to use, send it along :) I'm going to try something with that Neetu/Amitabh picture this evening - it is too groovy not to use. Those were a delight!! LOved AB and Neetu's pic. omg I got it! its the only explanation!!! and pls dont post this if u think im being stupid, but I do beleive I am right. The photo of Mithun is a staged pic for some mag, since I have researched enough to ensure that Mithun did not appear in a movie simultaneously with Anita and Dimple. The "NL" MUST stand for "Natwar Lal." No, not the 1979 movie- but the story behind it. Natwar Lal is/was a real life con man, and was quite notorious in the late 70s, before being caught in the mid 80s. His fame clearly affected Bollywood, unless my head is wandering. It was not only produced by Sashi Kapoor and had an excellent performance from him, it had a good story and acting by other actors too. Shyam Benegal directed the movie. It is not a masala movie for sure. Never Mind!! - Yay! I think that's my favorite too. Shweta - That is some serious research you have done there, and I am very impressed with the tie to real life! I have sent the photo to my most Mithun-knowledgeable contact (my brain finally remembered his email address), and I will certainly post whatever info he comes up with. And I support your obsession fully! Jasmine - It is not! But I can rent it locally, so that's the only reason I didn't buy it. It's definitely on the "to watch" list. "This was supposed to be a Bond type movie that never got made. I think it's one of the publicity photos. Can't remember the name now. Mithunda also appeared in a similar avtar for a popular brand surrounded by all the top models of India at that time like Kitu Gidwani, Sonu Walia, Bijli. I think it was for Mayur Fabrics. Btw, watch out for Mithunda's upcoming movies 'Zindagi Tere Naam' and 'Phir Kabhi'. Both are matured love stories. In fact, ZTN's songs are real good." kanan - Excellent research! Thanks for sharing. PS to all - now that I've seen Ajooba, I'm certain the Dimple/Shashi/Amitabh picture is from that film. Amitabh even has on the vial of shrinking/growing potion.